One of the things that I love about Christmas is that it is an occasion to eat really good, special food that one does not normally have. Of course in these days of plenty it is less of a feast than it once was, but as liturgically Christmas is a Feast, it seems very appropriate to eat well! Madeleines are one of my favourite things to bake, and making a batch is really easy as you need to make the batter in advance, and bake it from chilled. Once ready the batter can safely be kept in the fridge for a few days, and the cakes only take a about 10 minutes to bake, prep ahead at its best! A fresh Madeleine, still warm from the oven is sublime – light and airy, and with a crisp base. 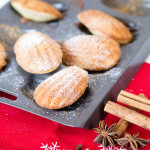 Going with the season I have spiced mine with a warming winter seasonal spice blend – containing cloves, cinnamon, cardamom and star anise amongst others – perfect for a Madeleine. Can I make Madeleines Dairy Free? Absolutely you can! Just replace the butter with the same weight of your favourite dairy free spread. I made my honey and orange Madeleines with a dairy free spread – when you are using a butter replacement it is even more important that you serve them fresh from the oven. 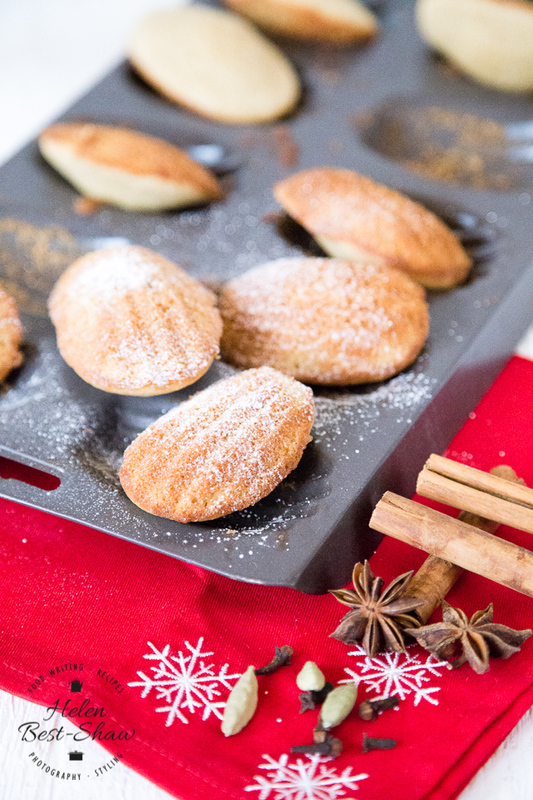 If you try this Recipe: Spiced Madeleines – perfect for the holidays please tag #FussFreeFlavours on Instagram or Twitter. It is amazing for me when for me when you make one of my recipes and I really do love to see them. You can also share it on my Facebook page. Please pin this recipe to Pinterest too! Thanks for reading Fuss Free Flavours! These beautiful little French cakes are astonishingly easy to make and will always impress. This version is gently flavoured with a warming winter spice blend. Weigh the butter into a saucepan and gently heat until melted. Remove the pan from the hob and allow to cool, but not solidify. Whisk the eggs and sugar together until they have doubled in size and are light and fluffy. Slowly fold in the flour, baking powder, spice and salt. Slowly pour in the melted butter, gently folding all the time until you have a foamy batter that is full of air. When mixed cover the bowl and put in the fridge for at least an hour to chill. Melt a little more butter and brush it onto a Madeleine pan, allow to cool and then dust with flour. Heat the oven to 190C/ GM 5. Use a spoon to fill the Madeleine pan with the batter so each well is about ? full and bake for 7 - 9 minutes until until risen, golden and shrinking away from the edges of the pan. Leave for a few minutes and then turn out. Dust with a little icing sugar and a pinch more spice to serve. The Madeleines are best enjoyed when still warm and crisp on the outside. They can be stored for a day but will lose that just cooked crisp outside. If you do not have a Madeleine tin then make these in a mini muffin pan.